The first bear, the better known of the two, wasn’t a bear at all. But at about 150 or so pounds, he looked like one and certainly had the heart of one. 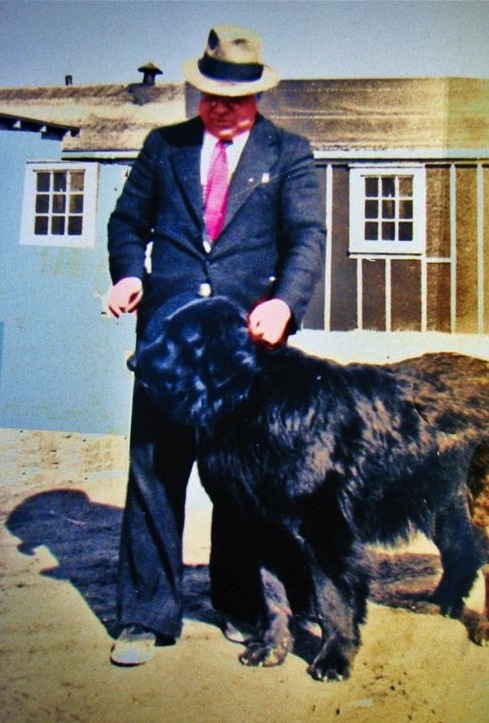 His name was originally Pal and his size can be imagined from this photo with William Freake, a tall chap on the staff at the Newfoundland Airport in 1938. Pal was living with a family in the early days of Gander. As he grew larger, the family wondered if such a large dog was right around small children. When he exuberantly and accidentally scratched a little girl’s face, the family figured Pal perhaps needed a new home. Being from Gander but now living in Quebec City, I was happy to learn that it was the 1st Battalion, Royal Rifles of Canada who adopted him. This regiment, though it has an English name, originated in Quebec City on 28 February 1862 and eventually amalgamated 22 February 1965 with a present day militia regiment, Les Voltigeurs de Québec. The battalion served in Newfoundland on garrison duty from early November 1940 to August 1941. They changed Pal’s name to Gander and “promoted” him to sergeant, even affixing sergeant stripes to his collar. 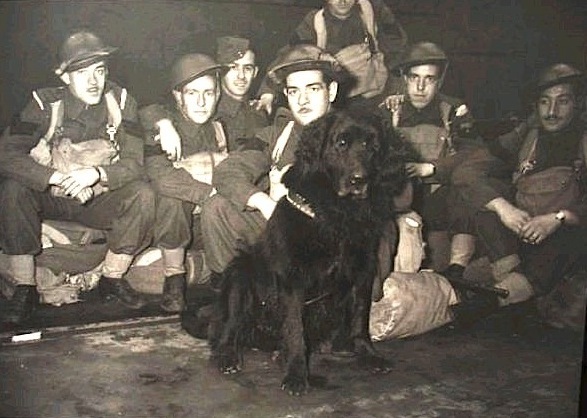 And when, in October 1941, they shipped out to Hong Kong, the soldiers took their now-beloved dog with them. 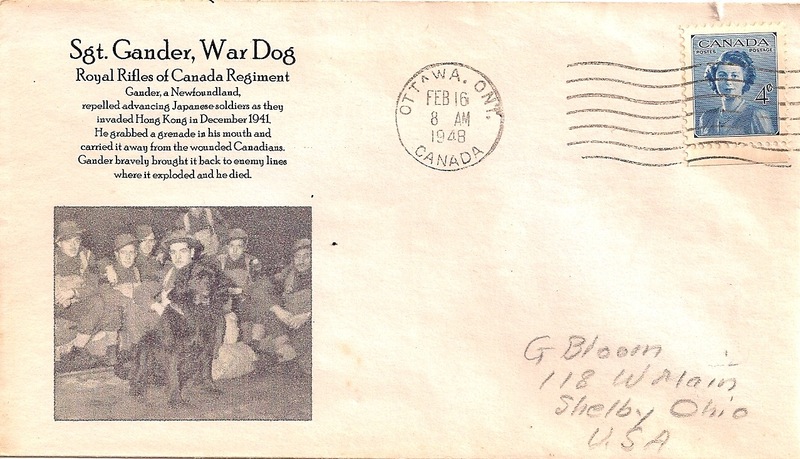 The story of Sgt Gander has been well told elsewhere so suffice it to say that when the Japanese came ashore, they thought that the Canadian had breed a new super-breed of attack dog. He ran after the Jap soldiers, biting their legs, He stood guard over wounded soldiers and when the Japs threw a grenade into a small group of defenders, he grabbed it up, but died in the process. Some years later, a First Day Cover using the photo above was issued in his honour. On October 27, 2000, the People's Dispensary for Sick Animals awarded Sgt Gander the Dickin Medal, more or less an animal equivalent to the Victoria Cross. At the insistence of survivors of the battle, his name was listed with those of 1975 men and two women on the Hong Kong Veterans Memorial Wall in Ottawa. In Gander Heritage Memorial Park, near the Cenotaph, a statue of Sgt. Gander will shortly stand proudly alongside a statue of an enlisted soldier forming one of the centerpieces of the park. 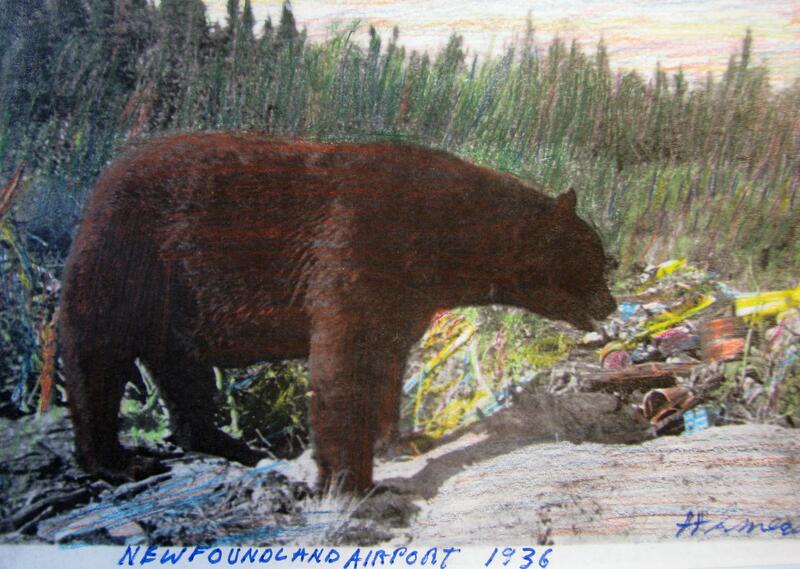 The other bear in early Gander history was a real one, the kind that would normally have one skittering for cover. 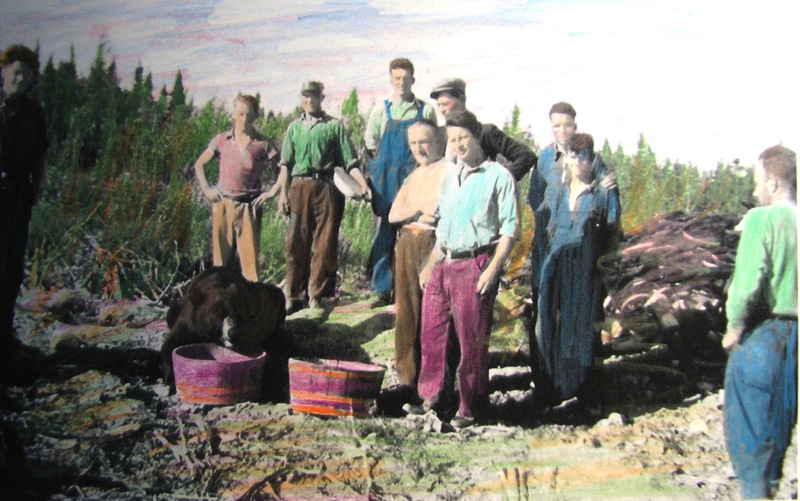 He took up permanent residence in Gander in the summer of 1936 as the first wave of workers arrived. As a young bear scrounging for food, he got to liking the leftovers the cook threw to him. Rumour has it that the bear liked the food better than the workers did, so no doubt he was well fed. 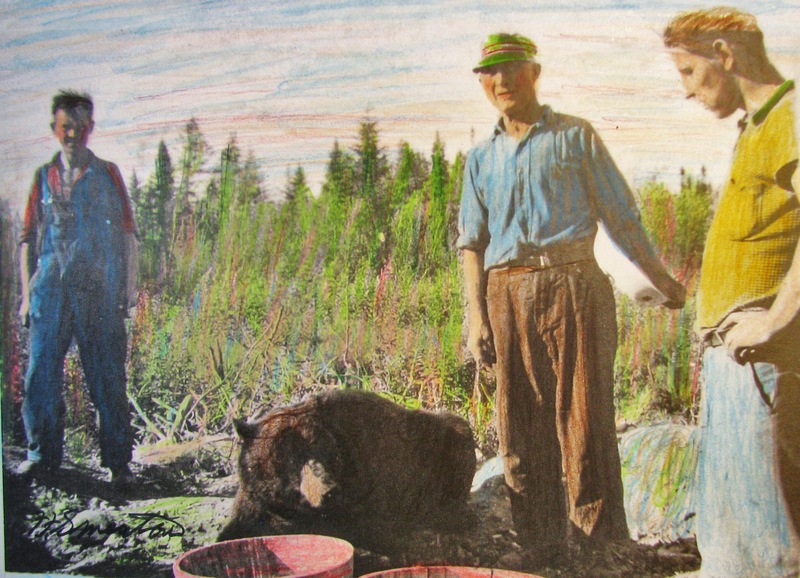 There was not a lot to do in those days, so feeding the bear was great entertainment. 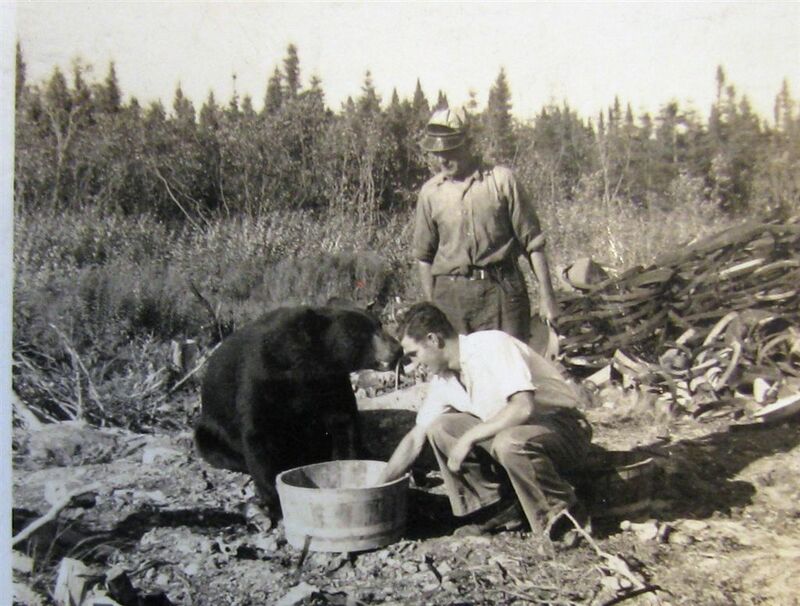 In the photo below, the young man feeding the bear is Steve Walsh (who later worked for Allied Aviation). The man standing is his father, Steve Walsh, Sr. who was Section Foreman of the Railway at Gander until around 1949. In fact he became quite tame and to the workers in early Gander, he was a much a pet as Sgt Gander. He was so tame that he wore a red ribbon around his neck as he wandered around Gander. Only one day he wandered onto a runway and was killed by a military aircraft. Funny when you think of it, the two “bears”, maybe ten thousand miles a part got killed because of the same war.